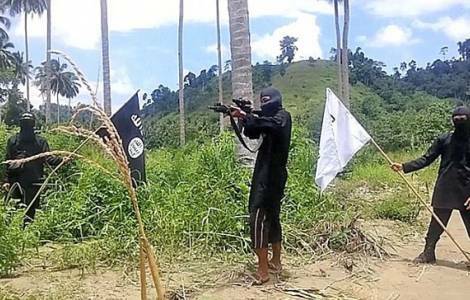 Marawi City (Agenzia Fides) - "Members of the Islamic State-linked “Maute” militant group, "attacked the Catholic cathedral of Marawi city and kidnapped about 15 faithful, including a priest, nuns, and some lay persons who were praying in church": confirms Bishop Edwin De la Pena to Agenzia Fides, who is at the head of the territorial prelature of Marawi city, town on the island of Mindanao in the southern Philippines. Yesterday, about one hundred militants of the “Maute” group occupied the city and, in response to that act of force, Philippine President Rodrigo Duterte put the island of Mindanao under martial law. The Bishop tells Fides: "Today is the feast of our Prelature, the feast of 'Mary, help of Christians'. The faithful were in church to pray on the last day of the novena. The terrorists broke into the church, took the hostages and led them to an unknown location. They entered the bishop's residence and kidnapped the vicar general, Fr. Soganub Dewatering. Then they set fire to the cathedral and the bishop's residence. Everything is destroyed. We are dismayed". The bishop saved himself because he was on a pastoral visit to the parish of a village outside Marawi. "The terrorists have occupied the city. People are terrified and locked in the house. We are waiting for the army's reaction. The important thing is to regain the city with the least possible bloodshed. Hostages have not been mentioned. We have activated our channels, the Church and Islamic leaders and we hope to be able to negotiate soon so they are released safe and sound", he said, observing that in recent months the church had received threats. "This happened just before the feast of Mary: we ask her for help. To her who is the help of Christians, we ask for the salvation of our faithful. Only she can come to our rescue. We also appeal to Pope Francis to pray for us and to ask the terrorists to release the hostages in the name of our common humanity. Violence and hatred lead only to destruction: we ask the faithful all over the world to pray together with us for peace".